Lake Union seen (from the north, looking southward) in 2012, against the backdrop of Seattle. Lake Union is a freshwater lake entirely within the Seattle, Washington city limits and a major portion of the Lake Washington Ship Canal. Its easternmost point is the Ship Canal Bridge, which carries Interstate 5 over the eastern arm of the lake and separates Lake Union from Portage Bay. 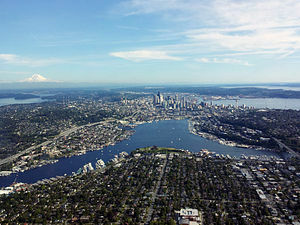 Lake Union is the namesake of the neighborhoods located on its east and west shores: Eastlake and Westlake, respectively. The northern shore of the lake is home to Gas Works Park. 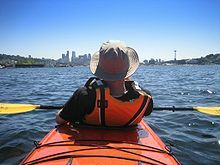 Notable features of the southern portion of the lake—collectively known as the South Lake Union district—include Lake Union Park, Museum of History & Industry (MOHAI), and the Center for Wooden Boats. The George Washington Memorial "Aurora" Bridge carries State Route 99 over the western arm of Lake Union. The Aurora Bridge is so named because it carries Aurora Ave N down the western side of the lake. Lake Union's westernmost point can be considered the Fremont Cut, which is located just east of the Aurora Bridge and is spanned by the Fremont Bridge. The Fremont Bridge carries Fremont Ave N between the neighborhoods of Fremont and Queen Anne and separates Lake Union from the rest of the Lake Washington Ship Canal to the west. A glacial lake, its basin was dug 12,000 years ago by the Vashon glacier, which also created Lake Washington and Seattle's Green, Bitter, and Haller Lakes. Lake Union received its present name from Thomas Mercer, who in 1854 correctly predicted that canals would someday join Lake Washington to Puget Sound in a "union of waters." The Duwamish called it - compared it with what is now known as Lake Washington - "Small Lake" or "Little Lake" (Lushootseed: XáXu7cHoo or Ha-AH-Chu, literally "small great-amount-of-water," the diminutive form of the word used for Lake Washington). In Chinook, an intertribal trading language, it was called Tenas Chuck ("small water"). Three major streets are named in relation to the lake: Westlake Avenue, which runs along its western shore from Downtown to the Fremont Bridge; Eastlake Avenue, which runs along its eastern shore from Cascade to the University District, and Northlake Way, which runs along its northern shore from the University District past Gas Works Park to the edge of Fremont. Several neighborhoods take their name from the lake: Eastlake, Westlake, Northlake, and South Lake Union. Lake Union, 1907, from Queen Anne Hill. Capitol Hill is straight ahead; the gas works (now Gas Works Park) can be seen at left, jutting into the lake. A large number of construction cranes can be seen around Lake Union in June 2015. Boeing began production on Lake Union in 1916. Shipyards, wharfs, and sawmills have also dotted the shore. Lake Union's proximity to and scenic views of Seattle make it a popular recreational spot. Seaplanes operated by Kenmore Air and Seattle Seaplanes land and take off from the lake throughout the day. Pleasure boats from Lake Washington pass through on their way to Puget Sound. The Center for Wooden Boats holds a yearly wooden boat festival. The world-famous Duck Dodge sailboat races are run on Lake Union each Tuesday during the summer. Rowers in sweep and sculling boats use the lake year-round. Paddle boarding and kayaking are also popular on this lake. Gas Works Park is the largest park on Lake Union and the most popular for Seattleites and visitors. It is the venue for summer concerts and Seattle's major Fourth of July fireworks show. Other parks ring the lake, clockwise around the compass from Gas Works which is nearly due north: North Passage Point Park, South Passage Point Park, Fairview Park, Terry Pettus Park, and South Lake Union Park. Lake Union flows into the Fremont Cut towards the Puget Sound. Part of the Lake Washington Ship Canal system, water flows into the lake from Lake Washington through the Montlake Cut, and out via the Fremont Cut on its way to Puget Sound. 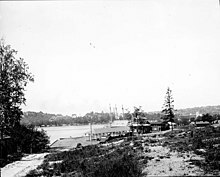 Before construction of the canal, Lake Union emptied into Salmon Bay via a creek which followed roughly the same course as the Fremont Cut does today. Because of the connection via the Hiram M. Chittenden Locks to the salt water of Puget Sound, there is some saline contamination, which increases in the summer as the inflow rate from Lake Washington decreases and the locks open more frequently for pleasure craft. Lake Union is home to several rowing centers and teams, including Holy Names Academy Crew, Lake Union Crew, Lake Washington Rowing Club and Pocock Rowing Center, all members of USRowing. Also rowing out of bodies of water attached to Lake Union are the Seattle Rowing Center and the Conibear Shellhouse, serving the Washington Huskies. Lake Union is home to two seaplane bases: Kenmore Air Harbor Seaplane Base (IATA: LKE, FAA LID: W55), and Seattle Seaplanes (IATA: LKE, FAA LID: 0W0), located one nautical mile (1.85 km) north of the central business district of Seattle. ^ a b c d e f g "Lake Union". King County. Retrieved 15 November 2010. ^ Phillips, James W. (1971). Washington State Place Names. University of Washington Press. p. 149. ISBN 0-295-95158-3. ^ Thrush, Coll (2007). Native Seattle: Histories from the Crossing-Over Place. University of Washington Press. p. 223. ISBN 0-295-98700-6.